The music venue Night and Day in Manchester is threatened following complaints from residents living nearby about noise. They suggested pictures fell from walls because the bass was so loud”. 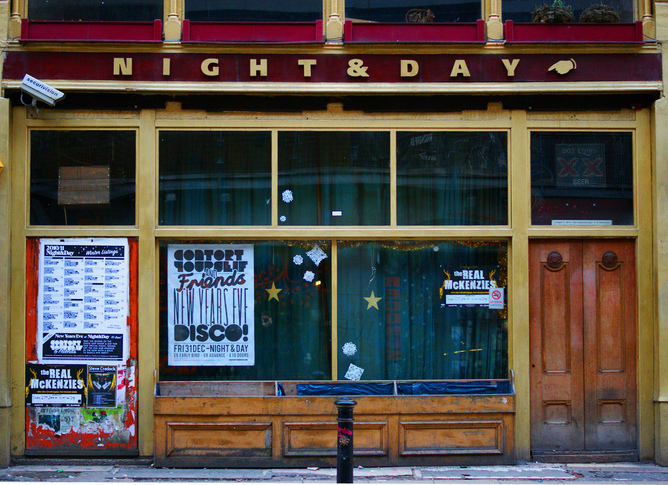 The venue, however, has been a stalwart of Manchester’s music scene, and many well-known musicians including Johnny Marr, Tim Burgess and Frank Turner have given their support to keeping Night and Day open. Sadly, this tension between the entertainment industry and urban residents is an all too familiar story. Many venues are continually being closed by metropolitan authorities responding to residents’ demands. Portland, Oregon is a city that has seen this tension severely affect its music scene. Like Manchester, Portland has a strong reputation for being a very creative and musical city. Artists such as Esperanaza Spalding and The Decemberists were nurtured by Portland and have now won Grammy awards and topped the charts. The city’s only all-ages music venue Backspace recently closed following the decision by the landlord not to renew the venue’s tenure. Local paper Willamette Week reported that owner David Gould felt that “music is not compatible with rest of tenants in the building”. The site of Backspace was situated within the city’s prestigious Pearl District, a previously industrial area that has been subject to gentrification in an effort by the city to attract young professionals working in the wider creative industries. With Portland’s emphasis on musical creativity, it might seem surprising that live music is an issue with the residents. This presents the paradox of gentrification: these areas wish to attract creative business types, but this results in the repression of the more independent creativity of the pre-existing community. There has recently been much research into the impact of gentrification upon musical cities. Post-industrial society recognises the need to attract the creative industries, and gentrification accelerates what is a natural economic process. But sadly, it tends to be the case that the commercial nature of this creative class tends to swamp the local, earthy creativity of these designated areas and zones. A recent article by Fabian Holt looked into how a series of local venues in New York, Copenhagen and Berlin have been closed down resulting from gentrification. She details a pattern of commercial venues moving in to creatively developing areas to cash in on the new resident’s needs and desires. These commercial venues are somewhat homogenised – think of The Academy Group, for example. Whilst employing the local community, they don’t usually provide performance opportunities for local musicians. Communities need venues that foster the early stages of music performance development, a place for teenage bands to play Nirvana covers to their mates, giving them that crucial performing experience. Venues such as SO 36 in Berlin, CBGBs in New York and Copenhagen’s Umdongshuset have all fallen victim to gentrification. This could also be the fate of Night and Day. Manchester’s Northern Quarter has a reputation for attracting creative types due to its wide array of cultural happenings, from live gigs to art exhibitions. The area however has been gentrified, and following the pattern is developing as a place for cultural industry – but this industry is pitting commercialism against community creative. This is a problem that needs to be addressed. As councils across the UK seek to create cultural zones to develop post-industrial creative economies there is of course a need to attract money making business. But currently this means that the fundamental creativity of the area is being threatened. Whose opinion should be more valid? The incoming residents, or the loved, worn, venue? Of course, both sides have a point. There needs to be a better way of addressing this question, protocol that should be followed, in order to avoid our creative neighbourhoods becoming bland. Night and Day is likely to survive, but it is another example of the constant threat faced by such important venues. More attention and discussion needs to be paid to the issue, or we will open our eyes one day and realise that all of our local culture has disappeared.